In recent times, retail has become more than a functional shopping trip. A day’s shopping experience is well-planned, with consumers setting aside time for product testing and trying on clothes, social interaction in-store and the all-important pit-stops for coffees and food. Retailers, especially across the main cities, have taken this trend seriously and begun to design their physical spaces around enhancing the customer experience. Physical retail is becoming less about a large-scale flagship and more about ‘brandship’. This doesn’t mean that wowing a customer with innovative retail design isn’t important; but it does mean that the way in which design positively reflects the brand is more important. Has a customer come away from the store revelling in the experience they had whilst shopping? Was the design focused succinctly around their needs? Has the brand stuck in their mind because of some key elements; interactive technology, tutorials or virtual reality? Big questions, but important ones when taking future retail into consideration. Whether it is a retail assistant or in-store touchscreen, retailers have been succinct at helping a consumer find what they’re looking for based on expectation and request. But what if customers were provided retail answers based on their mood when in-store? The act of browsing has been given a new twist, as retailers begin to tailor their offers to people’s personal moods” – Victoria Buchanan, LSGN Global. Visitors to Uniqlo’s flagship store in Sydney can don a headset before sitting in front of a screen to wait a series of videos. Inside the headset is a sensor, tracking brainwave reactive to the video before recommending a t-shirt to suit the mood of the wearer! Lush released an app for consumers to download, on which they can shop according to mood or even their favourite scents! Options include calm, confident, energised and happy! Once the mood is chosen, the matching products are shown with further information, tutorials and the nearest store to purchase from if the consumer is not already in-store. Mood retail is certainly a key player, but the biggest importance lies in getting it right. The t-shirt chosen by Uniqlo’s headset could be far removed from what a customer wants and the Lush product may be completely unfitting for a consumer’s skin, despite what the mood dictates. 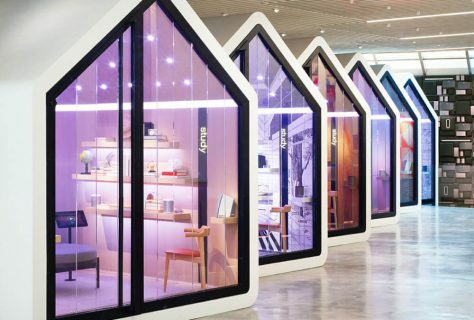 Treating this future retail concept as quirky, fun and customer-friendly is the winning concept for retailers – taking it too seriously could be its downfall. Despite titling this section apps, apps, apps – we’re going to start with something which isn’t technically an app! 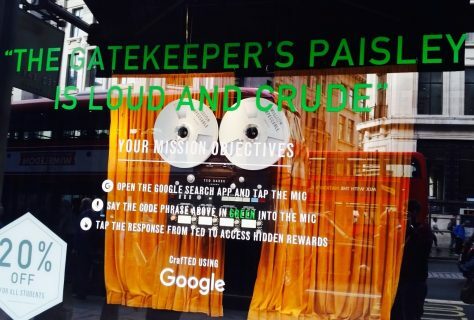 Ted Baker recently partnered with Google to take a huge leap in the future of interactive window displays. Customers can say key phrases into Google’s Voice Search which unlocks Ted Baker prices and offers for in-store. With plenty of Android phone users about, especially with the latest Google Pixel hitting the technology market, this app is a huge hit with customers. 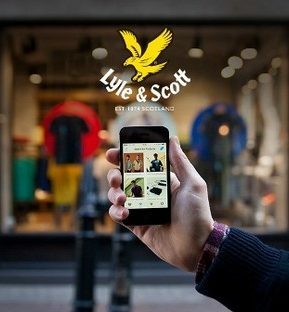 High-end knitwear brand Lyle & Scott partnered with Iconeme to introduce Beacon technology at its flagship store. After downloading the app, alerts can be sent from mannequins in-store to customers phones with special offers and rewards. It also works when customers are walking by the store, even if it is closed! 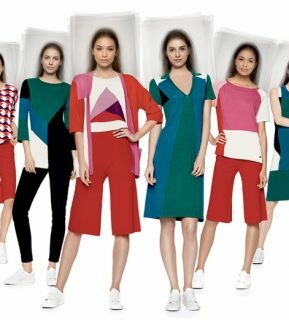 Fashion retailer Lyst combined fashion customer search data to create a highly innovative campaign. Large images captioned ‘Get A Wax’ and ‘Rubber Up New York’ clearly caught the eye of a consumer, whilst the actual meaning of the caption had been taken from trends and factual research. For instance, Get A Wax referred to an increase in wax and hi-shine jackets purchased and Rubber Up New York was based on a trend which portrayed male New Yorker’s spending more on rubber-soled shoes than women spend on heels! Not so much an input from the customer, but more statistics based on customers, United Colours investigated demographics of cities before creating a ‘Face of the City’ campaign. 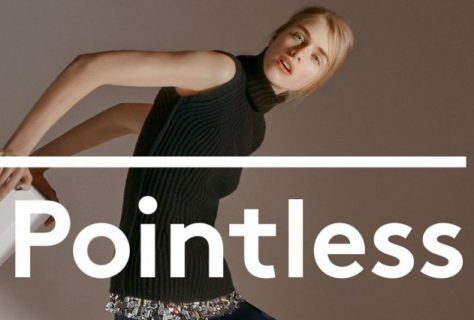 Racial mix, skin tones and the ethnic make-up all contributed to this campaign, meaning that customers were very much at the heart of the decisions made. The world of retail has been no stranger to these emerging trends. However, as we begin this fresh new year, we expect to see brands tackling future retail with more definitive approaches. 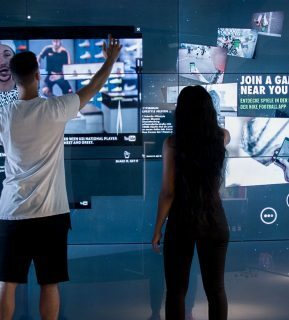 Experiential design combined with technology will continue it's innovation this year, but the concept of brands co-creating with their consumers is sure to be the talk of the future retail town.